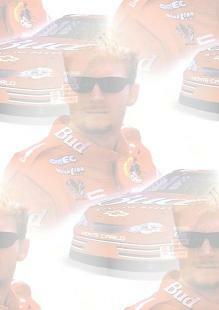 Our you ready for some NASCAR! Here are a few Nascar pillows. A while back I had permission to add them to my page but if this no longer is aloud please let me know and I will remove them. If you would like for me to make you one just e-mail me. 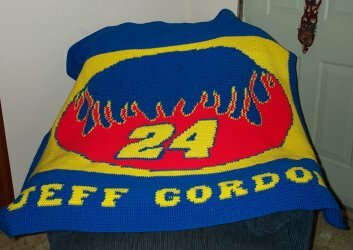 If you would like to make them for yourself here is the link Cindy's Crochet Pages. I finally finished this afghan. This one was a special order. I took forever to do. I think it came out great. Can take order's for one of these and this does take a while to make. 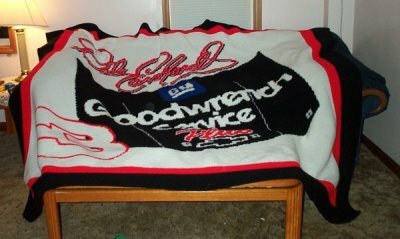 This afghan was also a special order. Don't have any in stock right now but I can take order's. 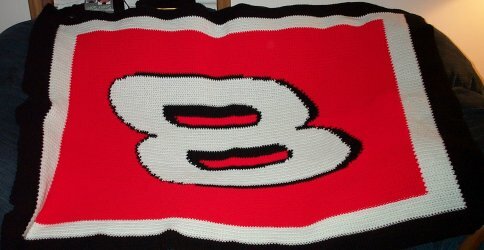 Have another Nascar afghan done. This one is available. More to come soon.